We all know that public services will not be sustainable in the short, mean or long term if productivity doesn’t suddenly rise (short term solution), or birth rates in developed countries increase (long term solution). That’s been the typical version about our demographic problem, or as some have referred to it, the demographic winter. This week, a study by Deutsche Bank was released, presenting that for the first time in history, the volume of population of people over 65 years was greater that the number of kids below the 5 years old threshold. After reading Factfullness last December I learned that reaching alarmist conclusions quickly never helps and it even makes rigorous study more difficult by setting us apart from reality and empiricism. 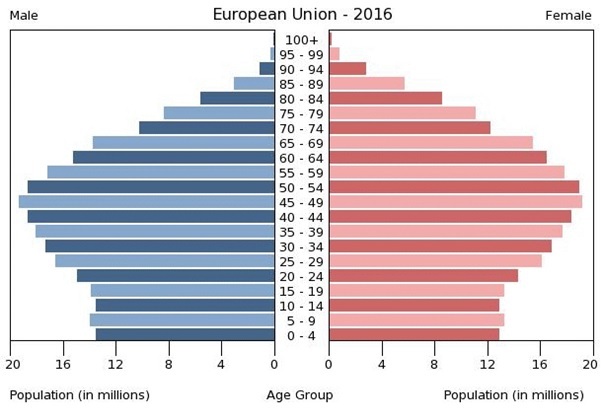 I definitely think there’s a big problem in Europe and the USA in terms of demography and productivity, but I consider that reaching excessively fast conclusions and giving once and again the same solutions over the need of larger families and greater birth rates, just gives strength to conservative thesis arguing for things as “natural family” or State support and subsidies for every new-born kid. And giving strength to conservatism in the actual European or American political situation is not right and either appropriate. First of all, because their traditionalist solutions have never helped to solve the problem of low inflation and economic growth, or stagflation, as it is many times called. I’m not talking about American conservatism in the economic sense, but more in the moralist one. Don’t misinterpret me either, I’m not supporting higher inflation, but just trying to show how conservatism or traditionalism have never been the solution to our productivity problem. Because it is a productivity problem. Even though many demographers and economists have argued that the Western problem are extremely low birth rates, I tend to disagree with the vast majority on them, as it has been empirically and historically demonstrated how as societies develop and standards of living rise, families tend to have fewer children (consequently the aggregate birth rate decreases), while at the same time other indicators such as life expectancy, health conditions or access to contraceptives increase. This represents progress. It has historically been the natural signalling of development for birth rates to decrease- after the Industrial Revolution birth rates decreased globally because families didn’t need kids working anymore to sustain them; afterwards came access to new medicines and wider healthcare services in continents as Africa and Asia, mainly since the 1980s, with births decreasing due to a massive reduction in death rates of children below the 5 years threshold. Infant mortality decreased enormously, by more than 60% according to the World Bank! On the other hand, productivity levels in Europe and the USA have stagnated throughout the past decade. And this is the real problem! According to this same study, American states had lost since 2016 almost half a percentage point in productivity, due to an increase in the proportion of people over 60 years old in the population, being of almost 12% in some states, precisely being those also the ones which saw a reduction in potential economic growth perspectives caused by lower productivity levels in aggregate terms. But we need to bear in mind that this decline in productivity is not just because older people tend to be less productive in value chains per se; as for developed countries this is just a mere fallacy. Why? Simple. Let’s think for a minute how developed countries have their economies constituted in terms of sectorial distribution. In most cases more than 70% of the labour force works in the tertiary sector, and what’s most valued overall in services are contacts, experience and business know-how, which makes older workers with greater experience and larger contacts lists even more productive! When people argue that older workers are less productive just for being old, they might be referring to developing economies with still large shares of their labour forces involves in the primary and secondary sector, where physical strength and resistance are some of the most valued skills, and where older workers are in disadvantage with younger ones. But as I mentioned beforehand, that’s not the case for Europe or America. Researching for this article and trying to find the causes for the coinciding decline of productivity levels in developed countries along with persistently ageing populations, I found David Autor. Autor is an American economist and professor at MIT, which has developed a very deep study and research on the causes and effects of automation in the economy, in terms of what jobs will be displaced, what will be the overall effect on the economy, and what policies should be adopted, if any, are required. For those with further interest, Autor has also several very interesting papers on the causes and effects of the disruptions of the Chinese expansion on the American economy in terms of international trade and labour markets. But let’s get back to the first of Autor’s points. He basically argues that it is not jobs that require lower education or preparation the ones that are replaced; or at least, not the only ones which are replaced, but jobs replaced are those that have repetitive characteristics or cyclical processes. So for example, someone who assembles furniture in different ways may not be able to be replaced if his task doesn’t repeat over and over again; and it may be a job that doesn’t require a high educational level. On the other hand, maybe, some accountants which have studied for more than 5 years at university may be replaced by robots who are faster and more efficient than them at calculating balances or cash flows, but only if the task is repetitive. Overall, what David Autor has studied at MIT is that Artificial Intelligence (AI) is not yet developed enough to be able to replace jobs that require thinking, analysing, taking decisions or which have some kind of link to social interactions. And how does this apply to the decline in productivity due to an ageing population? Well, what has been shown by a paper presented by Moody’s Analysis last week, and to which The Economist made reference, is that companies with older workers have lower incentives to introduce new and innovative machinery in their production processes, as training would be very expensive and their workers won’t last long enough in the firm to compensate that cost. This study also implies that younger workers adapt faster and more easily to new technology, bringing better results in a shorter time span; being both, more productive and more time efficient. So, we find ourselves in a situation with rising pension and public healthcare costs, greater dependency needs; and of course, enormous structural deficits which lead to tremendously high levels of public debt/GDP; both in the US and Europe. But… are there any viable solutions? I thought that some alternative but already consolidated public policy approaches could be useful to at least mitigate the current problem. First of all, rising retirement ages has shown not to be a good solution to the actual issue. Having a larger share of old workers in the economy will just throw productivity levels down to the floor, as has been shown above. So, a pretty good solution would be to liberalize labour markets and increase labour mobility across regions, states and nations. Making worker benefits (both social and private) portable could be an adjacent policy to facilitate freedom of movement across labour markets. Even though many conservatives won’t like my proposal, I truly think- as I have already expressed many times- that allowing a greater immigration influx is not just a humanitarian cause, but is also very necessary to solve situations as this. In the case of Spain, the participation rate of immigrants is nearly 69%, while that of national citizens is of 55%. Immigrants, also, in average present a fiscal surplus, by generating a level of tax revenues greater than the level of public resources they consume (healthcare, education…), according to a study made by the Spanish bank La Caixa. 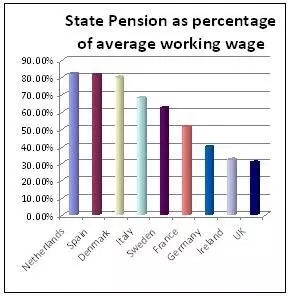 What we require to be able to pay for pensions; if our willingness is to have a stable and durable system, is to expand the labour force, increase productivity and consequently widen the taxable base. For that purpose, we need a dynamic society, flexible, adaptable to new conditions, ready to change and adopt new technologies. Ready to be more productive. And immigration provides that. It’s not ideology, it’s data. In conclusion, an ageing population is not an insolvable problem. We don’t need to adopt government subsidized pro-family policies, as those introduced in Hungary. Because that solution; in the best of cases, will solve this problem in 30 years’ time. And we need to solve it now. Greater investment in technology, to increase productivity, retraining of some workers in certain markets; to fight against job redundancy, much greater labour markets’ liberalization and more immigration are just some of the factors and policy approaches that could help to solve this ageing population crisis that developed countries are suffering. Or, at least, it will help to mitigate the damage.